[ Signature ] omote : Bishû Osafune jû Sukesada "備州長船住祐定"　ura : Eiroku jyû-nen Nigatsu-bi "永禄十年二月日"
Form : Shinogi-zukuri. Iori-mune. Mihaba is wide. Kasane is thick. Saki-zori attached. Chû-kissaki form. Nakago : Ubu. Yasurimes are katte-sagari. Saki is ha-agari. One hole. Jigane : Itame-hada. Part by part, ô-hada mixed. Jinie attached. Chike appeared. Utsuri-tasu in pale. Hamon : Shallow notare. Ko-gunomes mixed. Ko-ashis and yô appeared. Ko-nie attached. Sunagashi and tobiyakis appeared. A little muneyaki appeared. Boushi : It runs in sugu, then turns in komaru. Saki is hakikake. Sukeasada was name of swordsmith at Osafune, worked around very end of Muromachi period. There were many swordsmith who had tne name Sukesada. This sword has wide mihaba, thick kasane and sturdy body. Saki-zori attached, chû-kissaki form. On itame-hada jigane, pale utsuri appeared. Ko-nie attached hamon has variety of changes. It is precious even tne time signature of creation nenki-mei "年紀銘" exist. Kitae-hada is so tasteful. 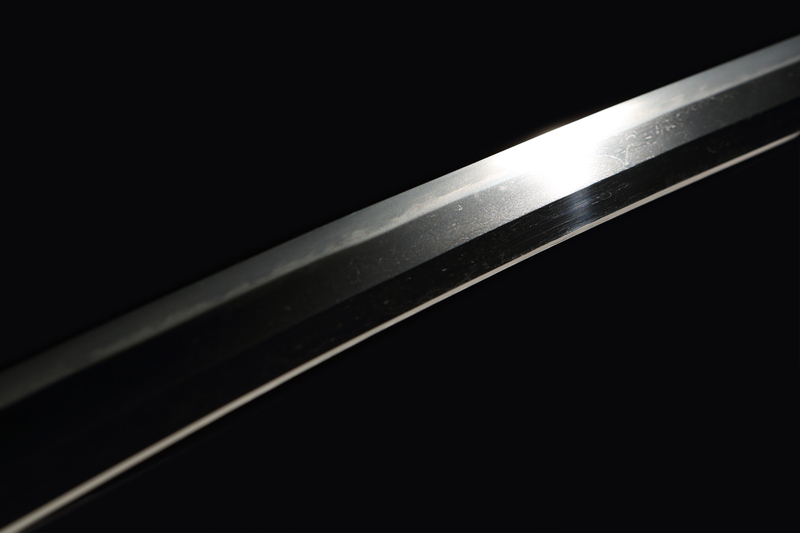 You can appreciate typical feature of Sukesada from this sword. [ Conditions ] There is a rust trace above 3-5cm of machiue of mune side. It is difficult to read three characters fune jyû suke "船住祐" on nakago-omote due to some abrasion.